Dynamo Moscow became the first side to book a slot in the KHL semi-finals after routing cross-town rival CSKA 5-1 in their third match-up of the best-of-five series. 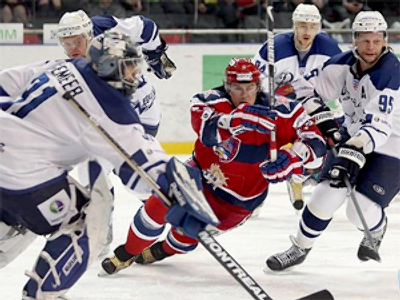 Having taken a 2-0 lead in the quarter-final series against CSKA, the blue-and-whites had every chance to move through to the last four on home ice. And the home side got off to a perfect start as Aleksey Zhitnik opened the scoring 11 minutes into the game. The alarm bells began ringing louder for the army men as Karel Rachunek scored on the power play to make it 2-0 in the second period. The blue-and-whites kept putting the visitors under pressure. First, Shitikov missed a great chance to score, but his teammate Denis Tolpeko had a bit more luck to make it 3-0. CSKA wasn’t giving up and they reduced the deficit through Ivan Khomutov's goal. But in the third period the home side secured their victory. With ten minutes to go, Rachunek made the game save as he finished well, while with just two minutes to go Kaluzhny completed the 5-1 rout and an unassailable 3-0 series lead. Dynamo now becomes the first team to book its place in the semi-finals of the playoffs.